Vertical Conveyors are fully integrated, multiple position conveyors used to raise or lower products between conveyor elevations. 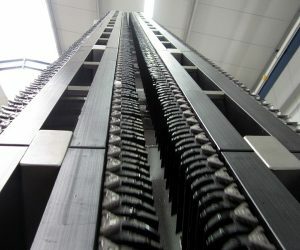 Generally, the Vertical Conveyor uses a section of Slip-Torque or Slip-Trak bed to transfer products in and out of the vertical conveyor shaft. Once the product is inside the shaft, the vertical conveyor mechanism activates and raises or lowers the entire conveyor bed to the appropriate elevation. Belt Width → 500-1400mm etc.